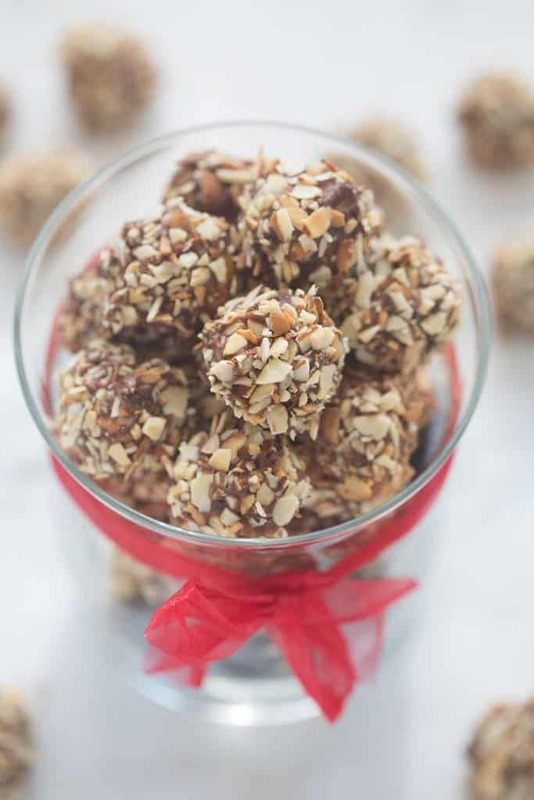 These 5-ingredient, no bake Vanilla Creme Balls are the perfect easy candy to make for family, friends and neighbors this holiday season! 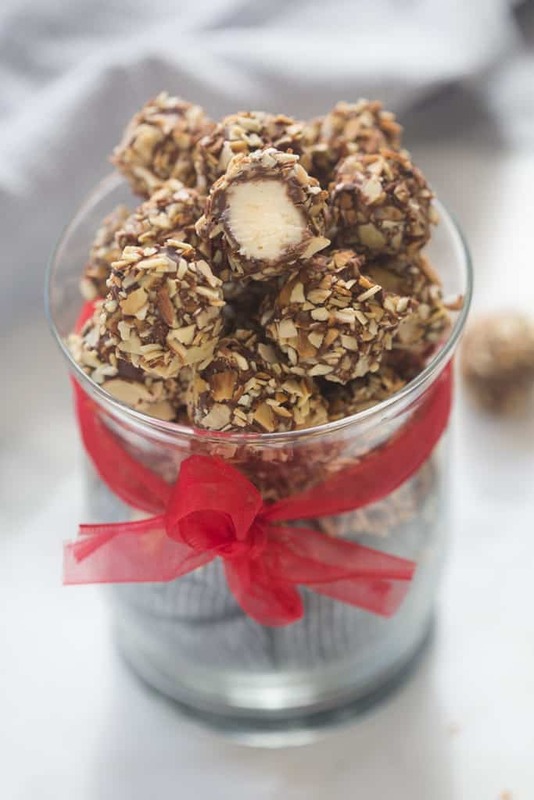 A creamy vanilla center, coated in chocolate and toasted almonds. Happy Thanksgiving weekend everybody! We hosted Thanksgiving dinner at our house this year with a few friends. We had a blast, but I was completely exhausted afterwards. Turns out that hosting a feast while 7-months pregnant can really wear a girl out! Nothing that some leftover lemon sour cream pie this morning couldn’t help with ;-). Are you all in full Christmas mode yet? We will officially set up Christmas tomorrow. I can’t wait to get our tree and decorate it with my kids. My husband and Jackson set up the Christmas lights outside our house yesterday and the squeals of excitement from my little boy made me so happy. Christmas with toddlers is so much fun! I love giving homemade candy to friends and neighbors for Christmas every year. My go-to is usually homemade caramels, but I have tons of delicious homemade candy recipes on my site to choose from. 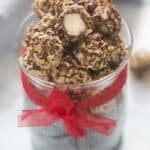 I’m excited to add this amazing Vanilla Creme Balls to the list of friends and family Christmas gift ideas. These Vanilla Creme Balls are a total copycat of a candy made popular by store in Brigham City, Utah called Idle Isle Candy. They sell lots of old-fashioned hand-dipped candies, but their Idle Isle candy, or “Vanilla Creme Balls”, as I’m calling them, are what they are best known for. They are super easy to make and super cute and festive too. Start with a really simple, 4-ingredient cream filling. Roll the filling into balls and freeze them until you’re ready to dip. The filling can be made weeks in advance if you’d like. Then, dip the little cream balls in melted chocolate and toasted almonds. YUM! Make the cream filling balls at least 1 or 2 days in advance. 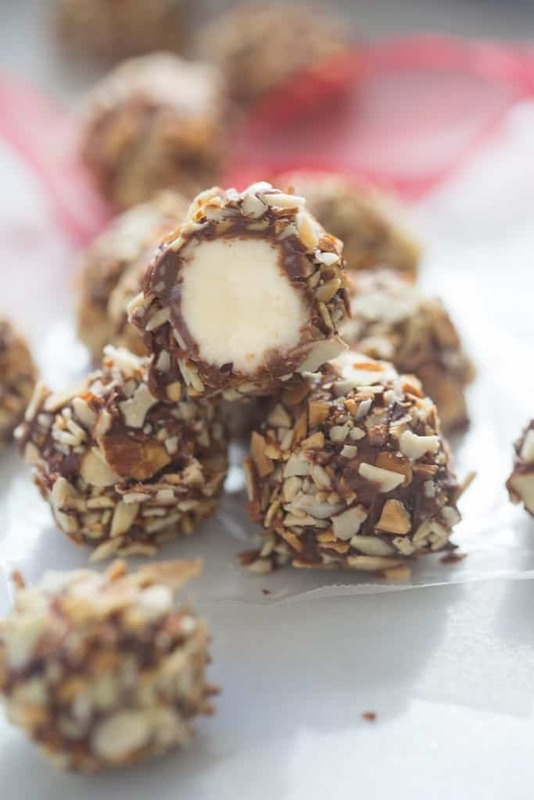 The vanilla creme balls hold together better when they’ve had plenty of time in the freezer (before covering them in chopped almonds). You can also toast and chop the almonds a day in advance if you want. Use high quality chocolate for dipping. I like to use Ghirardelli chocolate chips or large Hershey’s bars for dipping the creme balls. The better quality the chocolate the easier it will melt and the better it will taste! In a mixing bowl combine the butter, condensed milk, vanilla, powder sugar and salt. 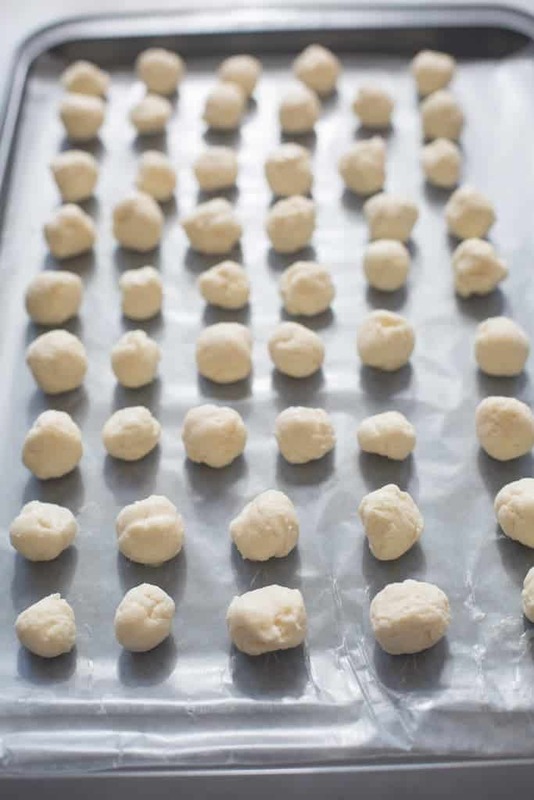 Roll the dough into small, 1/2 tsp balls and place on a lined baking sheet. I find it helps to grease my hands with cooking spray as the filling can be a little sticky. I also like to work with the cream filling in batches, leaving most of it in the fridge as I roll balls so that it doesn't get too soft sitting on my counter as I work. While the balls are in the freezer you can toast the almonds (this can also be done in advance). Heat a large non-stick skillet over medium heat. Add the sliced almonds and cook, tossing gently, until they begin to toast golden brown. This should only take a few minutes. Be careful not to let them burn. Allow them to cool and then use your hands to gently crush them into very pieces, into a bowl. Set aside until you're ready to use them. Once the cream filling is frozen, melt your chocolate. I like to melt mine in the microwave, on low power, in 15 second intervals, stirring after each interval, until smooth. 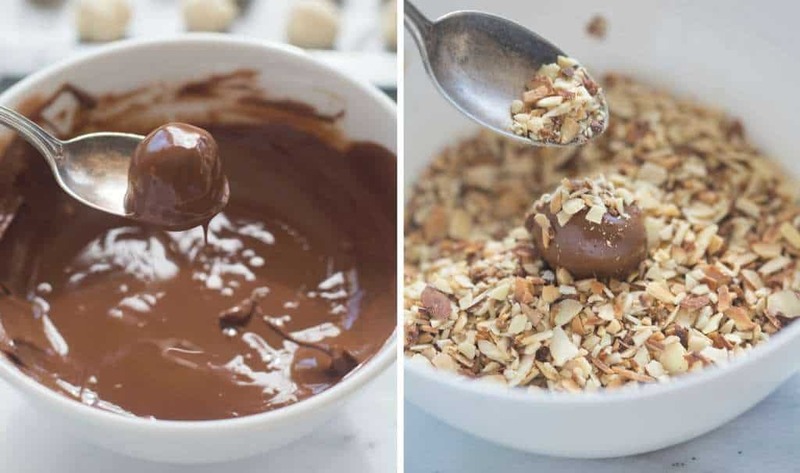 Dip frozen balls in chocolate, then in almonds. This is great to do with a companion, if you can, so it goes faster. Refrigerate until ready to eat. *If you don't want to make this big of a batch, you can always cut this recipe in half! Thanks Maria! Hope you get a chance to try them! Do these vanilla cream balls need to stay refrigerated after they have been made? I would suggest keeping them refrigerated. If you were serving them somewhere they would be fine to sit out for a little while though. Thank you. Can’t wait to make them. Merry Christmas! You can even freeze some for later but good luck with that! I’m constantly looking for simple homemade candy concepts throughout Xmas! This looks ideal. Hi Sarah, yes it’s 1/2 teaspoon. They will seem small, but once they’re dipped in chocolate and rolled in nuts they will double in size. Hope you enjoy them! Experiment with the size make some bigger and smaller it’s whatever you like best thing about makeing it yourself do you want one bite or two? I am making these, but they won’t get hard. They have been in the freezer for almost 24 hours. Any suggestions? Hi Beth, they wont ever get super hard, but if you think they’re too soft you could put them back in a mixing bowl and add more powdered sugar and then roll and freeze them again. I’m always trying to find easy homemade sweet concepts during Christmas! This looks best. Something didn’t work well. Even after adding more powdered sugar the consistency before rolling them into balls resembled frosting. Ended up just swirling it into some fudge. Hi Samantha, the filling wont ever get totally hard but it should be thick enough to roll into balls. It will still be sticky when rolling it into balls. I made these for our Christmas party at work, I had my kids taste test them…so good! Making another batch for the family!! I had a little trouble forming the balls hallway thru, started sticking, but after putting them in the freezer for a while I just re-formed the balls in my hands, they smoothed right out. Thanks Mary! So happy you liked them! Use a little butter on your hands it helps with the sticking. I followed this recipe to the letter and the consistence is completely liquid. I thine added 2 cups of confectionner’s sugar and there is hardly any difference. how much sugar are we supposed to add until it becomes usable? Hi Amanda, the batter will be soft but shouldn’t be completely liquid. You could add more powdered sugar if that’s the case. It will be pretty soft, but should harden up after being in the fridge for at least 20 minutes. Make sure you use sweetened condensed milk not evaporated or regular milk. This could be the consistency problem. I live just around the way from Idle-Isle and we have been making them for years. Great family fun, and try variations like chocolate sweeten condensed milk or pecans to roll them in. Making mine tomorrow. I also Brown the butter just be careful not to get any of the dark flakes into the mix. It adds an extra step but well worth it. Also I buy slivered almonds and beat the heck out of them in the package to make the nuts to roll them in I tried a food processor and it just didn’t taste the same don’t know why. I wanted to make these for goodie bags, but I’m worried because they wouldn’t be kept in the refrigerator. Should I choose something else to make? Hi Shawna, that would largely depend on your climate–when I lived in the midwest where it’s humid I couldn’t leave these out at room temperature, but in the dry climate I live now they may be okay. To be safe you may want to choose another recipe. Some suggestions from my site: Brownie truffles (https://tastesbetterfromscratch.com/brownie-truffles/), or homemade caramels (https://tastesbetterfromscratch.com/homemade-caramels/) would hold up well.